So I kind of took a blog vacation there for July, this post was written in the first week and I just didn’t post it but hey, better late than never, right? A couple weeks ago my wife and I took the kids on a trip down to Boston to visit the Lego Discovery Center at Assembly Row in Somerville, Massachusetts. The kids got to run around and play with Legos, they had fun for a couple hours but were ready to bail by lunch time. Assembly Row has a nice blend of shopping, eateries and activities all within walking distance and a free parking garage so we decided to stick around and hit up American Fresh Brewhouse. 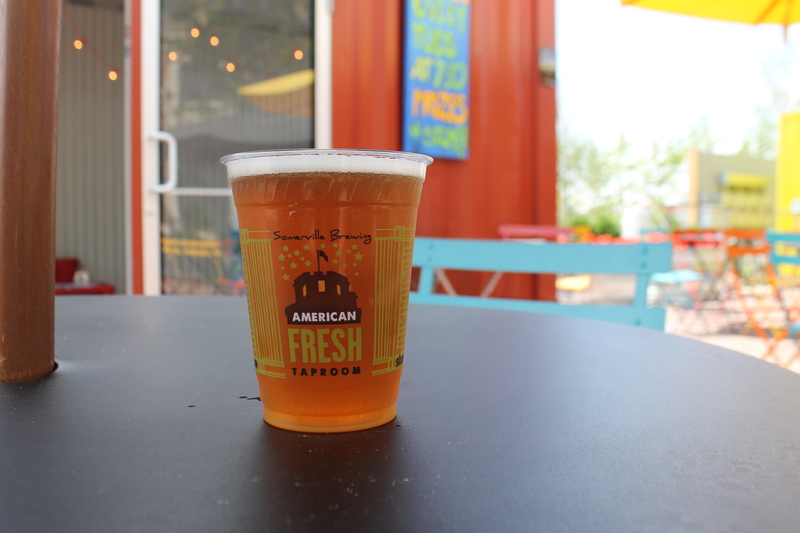 American Fresh Brewhouse is a beer garden serving locally brewed beers by Slumbrew. 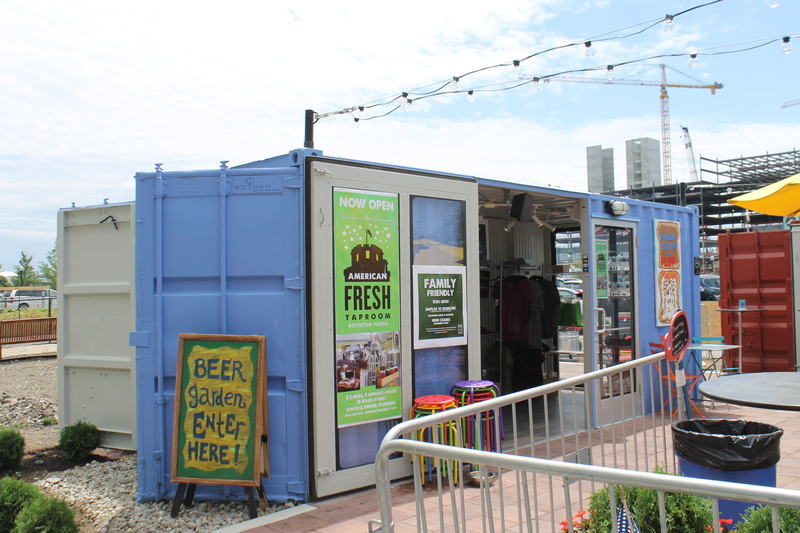 American Fresh consists of a patio area with umbrella covered tables and high tables for standing all surrounded by converted shipping containers. 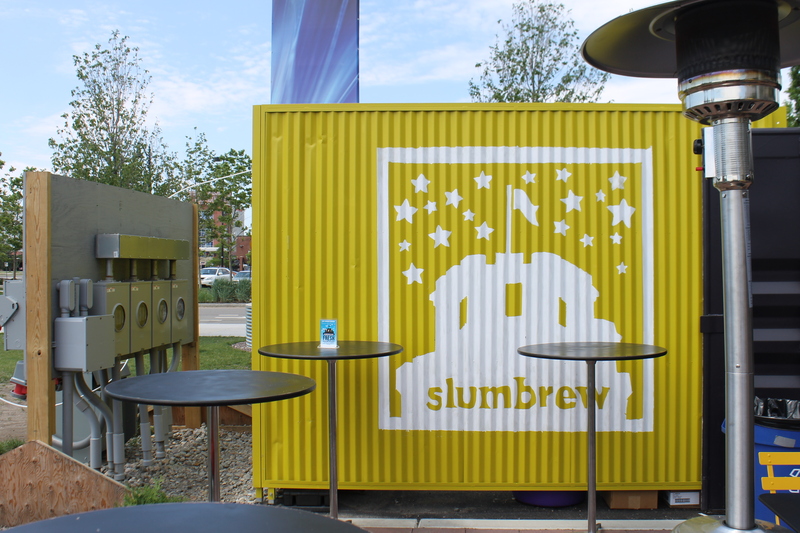 Each container serves a different purpose, one is a gift shop, another holds the bathrooms, a play area for kids and another holds the kitchen and tap lines. 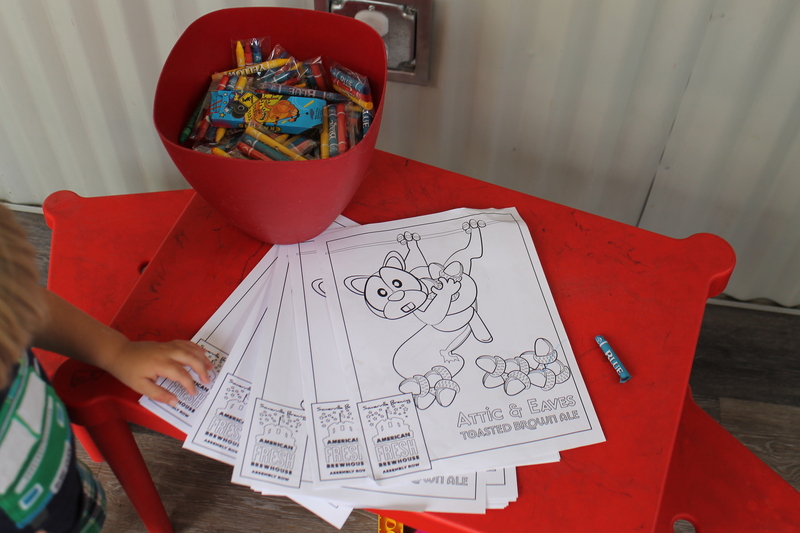 The kids naturally gravitated to the play area where they had a variety of toys and even coloring pages themed after one of their beers. While the kids were occupied we ordered some lunch. The menu is small, it’s meant to compliment the beer, we ended up ordering a flatbread pizza for the boys and a Turkey sandwich with Havarti and a side salad as well as a Flag Raiser IPA to share since we were heading right out of town after lunch. We were there shortly after opening so it was pretty quiet and the food came out quick. The sandwich was great and the salad that came with it was super fresh, the boys were far more interested in the play area than the pizza so I ended up eating most of that for them, it was just a simple flatbread with sauce and cheese but it was very good. I would recommend a visit to American Fresh, good food, great beer and family friendly. I was more impressed with them than with the Lego Discovery Center. 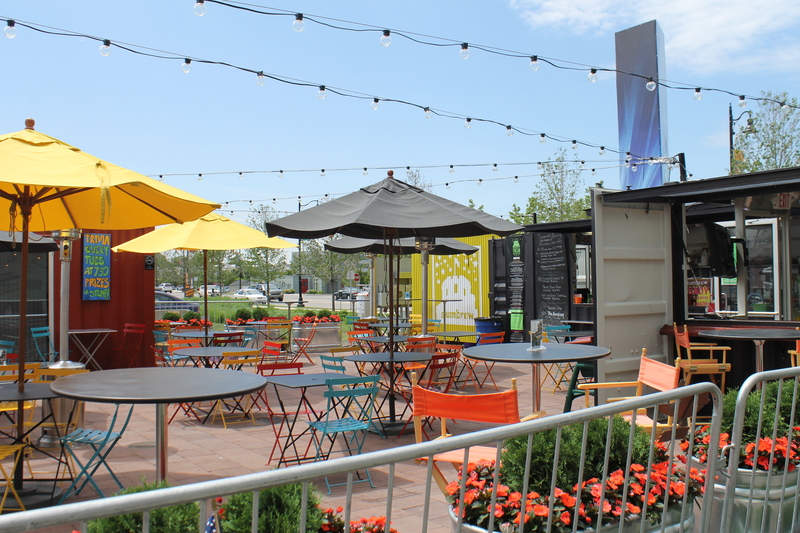 I do wish we had more time to explore Assembly Row though, it was a nice day and the area is pedestrian friendly and the parking was free, maybe next time. 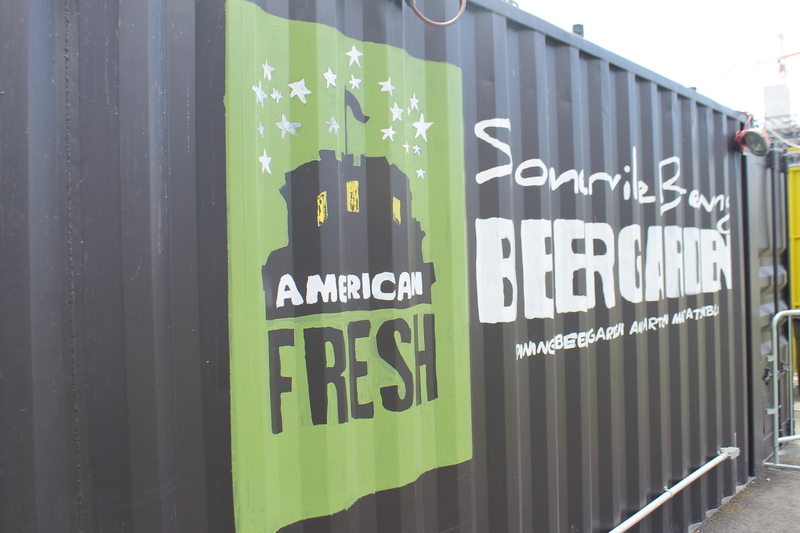 American Fresh Brewhouse is an open air beer garden in the spring and summer, when it gets colder, around October they put up a big tent over the whole place and bring in heaters. They close down after the new year for a few months when it’s the coldest and open back up in the spring so plan your trip accordingly.